Colours & Guns an 80 page set of land based rules system designed for 10mm Napoleonic figures. They will whet your appetite for Napoleonic wargaming in our speciality scale, 10mm. The rules are simple enough to get a grasp of quickly but have enough variety and complexity to make it a game you'll want to play again and again. With so many nations to choose from where will you begin……? 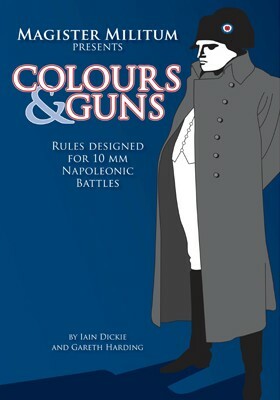 The rules are choc full of photos, diagrams, army lists and sketches of some of the most famous Commanders of the day. We've placed the quick play sheet on the back cover, so they don't take up much room on the table and the spine of the book stays neat. Units are infantry battalions, cavalry regiments or batteries of guns.